In a recent interview I did with Drs. Kent and Gentempo, we explored the work of RJ Watkins, a true pioneer of chiropractic. The interview is reproduced here with images and a few more details about Watkins’ life. The thing that excites me the most about exploring chiropractic history and philosophy by looking at individuals is the Bigness of chiropractic. Gentempo really made this clear towards the end of our discussion. He suggests chiropractors should look back and not just forward to the next new thing. The Bigness is unmistakable when you do. The book that changed my life more than most was B.J. Palmer’s Bigness of the Fellow Within. The book sat on the shelf in my chiropractor’s lending library. I used to arrive early to study the gems inside. For me, it was especially exciting because I had been going to chiropractors since age four and had never heard of B.J. I had already completed a bachelors degree in history, with a focus on European intellectual history. My emphasis was the vitalistic philosophers. At the time of discovering the Bigness, I was completing my masters degree in philosophy. So when I came to B.J.’s writings for the first time, I was primed and ready. Reading B.J. was actually a break for me from studying Plato, Aristotle, Descartes, as well as Buddhist and Hindu philosophy. The subtitle of my thesis was Plato and the Body, Mind, Soul! In B.J.’s writings I found something rare. He was able to write from a different voice than most of us access. He not only wrote about classic issues from the history of philosophy but he wrote from the perspective of the Bigness (much of the time anyway). Knowing about something is one thing; embodying it is another, and being able to speak or write from that embodied knowing is extremely rare indeed. Research into the linguistics used by individuals at very complex levels of knowing and being has been documented. It fact, there is a whole field of study called Constructive Development. I explored this in detail in a recent paper on B.J.’s life. But no amount of words may convey the Bigness. Rather than take you through B.J.s writings, I suggest you go and get the book! There are also several resources on this site and our other sites, where you may explore this Bigness in greater detail. The Bigness of chiropractic is so simple and yet it has many dimensions. The chiropractic adjustment at the right time, in the right place, with the right amount of force, in the right direction, is the basic dimension. Knowing the power of the innate within is yet another dimension. Knowing the relation of your innate to the infinite of which it is a drop, is yet another. The dimensions go on and on. Bigness. Firth, J. (1923). Chiropractic Symptomatology. Palmer, BJ. (1949). The Bigness of the Fellow Within. Palmer, BJ. (1959). Giant vs. Pygmy. Senzon, SA. (2004). The Spiritual Writings of B.J. Palmer. Senzon, SA. (2010). An Integral Biography of B.J. Palmer. Senzon, SA. (2011). The Development of B.J. Palmer’s Principles (online course). Senzon, SA. (2013). Chiropractic Lineage. Watkins, RJ. (1948). From CMCC Technique Manual: Muscle Palpation. Weiant, C., Verner, R., Watkins, RJ. (1953). Rational Bacteriology. Watkins, RJ. (1959). Neurology of Immunization: (with later updates). Watkins, RJ. (1975). Finger Walk. Watkins, RJ. (1975). All or None. Watkins, RJ. (1985). Joint Function. D.D. Palmer became a magnetic healer in 1886, when he moved from Burlington, Iowa, to Davenport, Iowa. It was in Davenport that he gave the first chiropractic adjustment to Harvey Lillard at 4:00 pm on a Wednesday afternoon. The date was September 18, 1895. After christening his new practice “Chiropractic” in June, 1896 (a term suggested by his friend Rev. Samuel H. Weed), Palmer soon decided to teach it. This of course came after a near fatal train accident in 1897 in Fulton, Missouri. D.D. started teaching palpation in 1898, with the enrollment of his first student on January 15th, Leroy Baker. Baker did not complete the course (which took from two weeks to three months). The first two graduates were William A. Seeley, a homeopath, and A.P. Davis, M.D., D.O. In those early classes, D.D. only taught adjusting of the 4th to 12th dorsal vertebra. In 1902, D.D. moved to Pasadena, California for a short time, where, he was arrested for practicing medicine without a license. [3, 4] In 1904, he went back to southern California and also to Portland, Oregon. He started schools in both locations. By 1907, there were at least thirty-nine schools started in Iowa, Oklahoma, Texas, Minnesota, Oregon, California, Michigan, Washington, Indiana, and Illinois. In 1908, the first side-posture adjusting was used by Carver. There were now between 400-600 practicing chiropractors. By 1910, there were 2,000 chiropractors and atlas was adjusted for the first time. In 1912, the first “stretching device” is used by chiropractors as well as the first adjusting table with springs. The Zenith Hylo table received its first patent on June 8th of that year. Also in 1912, the National College was the first chiropractic college to introduce dissection. Here is a brief discussion turned into a short movie about Craven between Drs. Kent, Gentempo and myself. D.D. Palmer died in 1913. His ashes were placed at the Palmer School of Chiropractic on August 21st, 1921. There are many wonderful books, chronologies, and articles exploring the history in detail. There are however too few scholarly papers on the philosophy of chiropractic. In many ways, the discipline of philosophy has been a casualty of the history of chiropractic. That is the topic of another blog post. The Association for the History of Chiropractic is very active. Please become a member of the AHC and then be sure to join the facebook page where ongoing discussions happen daily. Also, if you are feeling adventurous you should head to Colorado this July for the 33rd annual conference: HistCon 33. In honor of D.D.’s 168th birthday, we just launched the Philosophy of Chiropractic Library. The library emphasizes books and articles on the philosophy and history of chiropractic, which are accessible online and mostly free. There are also a few interesting reads on science, art, and Integral Theory. We hope you enjoy! The library will grow so check back often. It is only by mastering your knowledge of the history, philosophy, and science of chiropractic that you become a true master of your art. 1. Evans, H. (1979). Chiropractic Historical Data. Stockton, CA: World-Wide Books. 2. Zarbuck, M. (1988). Chiropractic Parallax: Part 3. Illinois Prairie State Chiropractors Association Journal of Chiropractic. July. 3. Keating, J. (1998). D.D. Palmer’s Lifeline. 4. Zarbuck, M. (1988). Chiropractic Parallax: Part 1. Illinois Prairie State Chiropractors Association Journal of Chiropractic. January. 7. Ralph W. Stephenson. (1927). Thirty Three Principles. In Chiropractic textbook: Volume 14. Davenport: Palmer School of Chiropractic. 8. Palmer, B.J. (1932). The Story of Crowding the Hour. In Clinical controlled chiropractic research; vol. 25. (1951). Davenport, IA: Palmer College. (page 510, principle 63). 21. Senzon, S., C. Kent, and P. Gentempo. (2011). Chiropractic History with Simon Senzon: “Simon Says Segment”. On Purpose. *Quoted from Sinnott, R. (1997). The Greenbooks: A collection of timeless Chiropractic works – by those who lived it! Mokena, IL, Chiropractic books. When most people think about chiropractic lineages, chiropractic families come to mind. Chiropractic history is characterized by families like the Palmers, the five generations of Clevelands and Austins,[2, 3] the Montaño-Luna family, as well as other famous families like the Parkers, the Gelardis, the Clums, and the Logans. The list goes on and on. The lineage I am most excited about lately is what I am referring to as The D.D. 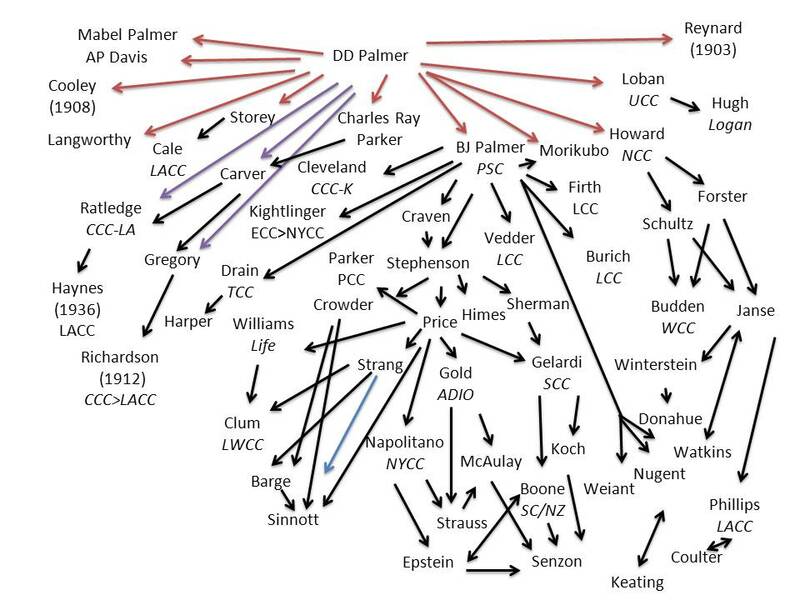 Palmer Philosophy Lineage. It is a way to explore the philosophy of chiropractic more completely. As one of my philosophy professors once asked, how can you develop a philosophy if you don’t know what came before you? By exploring the developments in the philosophy from each of these individuals (and more), we may evolve the philosophy further than it has gone before. After inventing chiropractic and opening his school in the late 1890s, D.D. Palmer traveled extensively between 1902 and his death in 1913. He opened schools all over the United States from Davenport to Los Angeles, Oklahoma City to Portland, Oregon. He encouraged his students to “practice and teach,” the new science, art, and philosophy of chiropractic. And they did. By exploring the writings of his actual students, we may begin to explore the impact he had on the philosophy of chiropractic in some interesting ways. We may even better understand Palmer himself, as seen through the eyes of his disciples. Three of his students I am currently fascinated by are Tullius de Florence Ratledge, C. Sterling Cooley, and A.T. Godzway. Each of these students met Palmer during his time in Oklahoma and studied with him in 1907. This was just after Palmer spent 23 days in jail for practicing medicine without a license. He moved to Medford, Oklahoma, with his new wife (his fifth) and went into the grocery business for a short time. He also maintained a small clinic and school out of his home. Ratledge was an amazing individual. He received his chiropractic degree from Willard Carver. Carver opened the Carver-Denny School of Chiropractic in 1906 in Oklahoma City. Ratledge also attended D.D.’s lectures in 1907. He had Palmer and his wife, Mary, over for dinner often. They discussed all things chiropractic far into the night. D.D.’s final teaching appointment was at Ratledge’s school in Los Angeles from 1912-1913. Only by learning all that we can about D.D. Palmer and the writings of his students can we begin to make sense of the challenges facing the profession today. They planted the seeds we now sow. This Oklahoma lineage of D.D.’s students would not be complete without a glimpse at A.T. Godzway, formerly EL Cooley, classmate and father of CS Cooley. According to Godzway, he bore the brunt of D.D.’s famous temperament. D.D. referred to A.T. as the “old medical fool.” This helps us to better understand D.D. as a man, with faults and challenges, like any of us. It also helps us to see how Palmer dealt with the medical paradigm. Most importantly, it gives us yet another glimpse into the first hand teaching from D.D. to one of his students. By exploring the writings of each of D.D.’s students and subsequently, their students, we may begin to piece together the puzzle that is the philosophy of chiropractic. While the most familiar and widely taught components of the philosophy came directly from the Palmer school, the seeds that D.D. Palmer planted were many. Which of those early students grew those seeds into important philosophical approaches to Innate, healing, subluxation, and life itself? Which ones took D.D.’s philosophy in a completely different direction, a direction he may not have approved of? The only way to truly find out the answers to these questions is to go back and reconstruct the lineage. Only then may we move forward. Knowing what came before and knowing the pioneers of each chiropractic idea helps us to move forward into the future. 2. 5th Generation Chiropractor Graduates Palmer West. 2011. 3. Five Generations of Chiropractic. 1995. Dynamic Chiropractic. 5. Keating, J. Chronology of Alva Gregory, M.D., D.C. 1998. 6. Palmer, D.D. The science, art, and philosophy of chiropractic. 1910, Portland, OR: Portland Printing House. 7. Carver, W. History of Chiropractic, ed. J. Keating 1936/2002: National Institute of Chiropractic Research. 9. Kent, C. and P. Gentempo. On Purpose: Chiropractic History with Dr. Simon Senzon (quarterly segment). 2012. * Republished with permission of the Association for the History of Chiropractic. ** Republished with permission of the ACA. I recently had a long private conversation with Rupert Sheldrake about his latest research and his new book, Science Set Free. (1) We plan to talk again in a couple of months and record the conversation. This will be part of a new series of dialogues I am engaging in with leaders from various fields. The dialogues will be available online. The video below describes some of the background of the new book, which is a MUST READ for all chiropractors and chiropractic students. Besides the main points of the book, which are described in the video, I suggest there was one important distinction Sheldrake made in our conversation that applies directly to chiropractors. It was this: he does not consider himself a Vitalist but an Organicist. This is important because the philosophy of chiropractic is more congruent with Organicism than with Vitalism (in my humble opinion). Since the book described the historical and philosophical roots of vitalism as part of the discussions about the limitations of the materialist, mechanist, and physicalist worldview that dominates science, I asked him whether he considers himself a Vitalist. The answer was NO. I have written in the past on the problems of using the term vitalism to describe the philosophy of chiropractic,(2) but Sheldrake’s explanation was simple and to the point. Vitalism was always about biology and how it was distinct from physics and chemistry. Organicism is rooted in the idea that the entire universe and its parts may be viewed as organic wholes nested within wholes. (3) This may be extended further whereas consciousness may be viewed as part of nature rather than apart from it. This approach is more congruent with the philosophy of organism, systems theory, and holism, all of which have their roots in 1920s biological thought, just like the chiropractic greenbooks. It is only recently that chiropractors have used the term vitalism. It is a term fraught with ancient baggage. Most organismic philosophers such as Sheldrake do not use it. Sheldrake’s research and hypotheses offer a framework that connects B.J.’s insights directly to the way Innate Intelligence governs the body’s shape and form. It is an important body of work for chiropractors to understand. 1. Sheldrake, R. (2012). 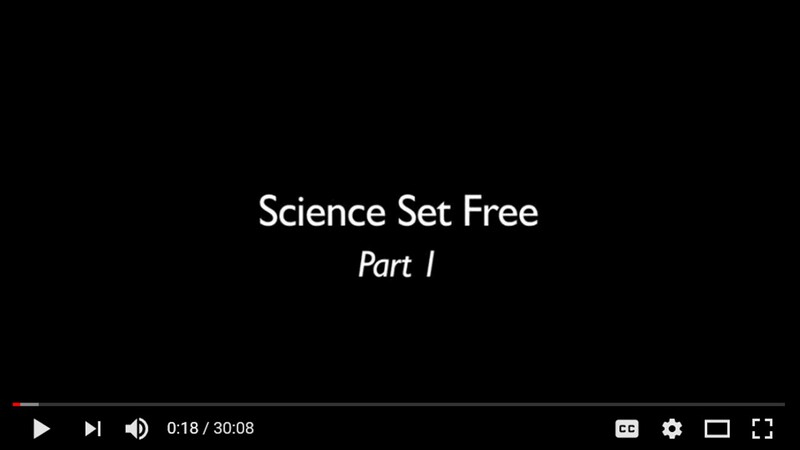 Science Set Free: Ten Paths to New Discovery. 2. Senzon, S. (2003). What is Life. Journal of Vertebral Subluxation Research. 4. Senzon, S. (2011). B.J. Palmer: An Integral Biography. Journal of Integral Theory and Practice. 5. Senzon, S. (2004). The Spiritual Writings of B.J. Palmer. 6. Palmer, B.J. (1949). How the Law Works. Excerpt from Chapter 19: What is Finding Yourself, in The Bigness of The Fellow Within. Published in: Sinnott, R. (1998). The green books a collection of timeless chiropractic works-by those who lived it! [Mokena, IL], Chiropractic Books. On December 18, 1948, we had to go to Des Moines, 186 miles from Davenport. Should we drive or go by train? The 15th, 16th, and 17th of December were beautiful, sunshiny days, ideal for driving. On the 15th, Innate told me to go my train. Reservations were made accordingly. At 8:00 A.M. on the 18th, it began to drizzle; it froze; the roads were sheets of ice. It snowed all day, on top of the ice. Roads were “extremely hazardous” and warnings were issued to “keep off all highways.” Innate knew! One minute after reaching the taxi stand, a private car drove up. “Are you Dr. Palmer?” I replied I was. “Can I give you a lift somewhere?” We piled in. Innate worked years ago from us through this Chiropractor, Dr. Julander. Innate has worked through this particular Chiropractor for thirty-five years, he never deviating from the Innate principle and practice; therefore, Innate worked in the patient, relieving his earache. This patient, having taken adjustments, was a better receiver; therefore, it worked on this occasion through him, for us. Many will say this was coincidence, accident, luck, just happened. To the majority, it would be that. When “incidents” like this “happen” consistently and persistently, time without end, year after year, under many varied conditions, it becomes a law at work. How did this kind friend and his wife know we needed a lift? We had never met him, nor he us; he had never seen us before, nor we him. There is such a thing as my Innate communicating to his Innate, that dark and stormy night, what my Innate knew we needed. The message was flashed, he received, it was sent to his educated mind which was in tune with his Innate; he followed the suggestion, looked around at the waiting crowd, found me (because he, too, was one of the successful men), came directly to me, and away we went to the hotel. That’s how the law works between one person and another who are in tune with the law within. 7. 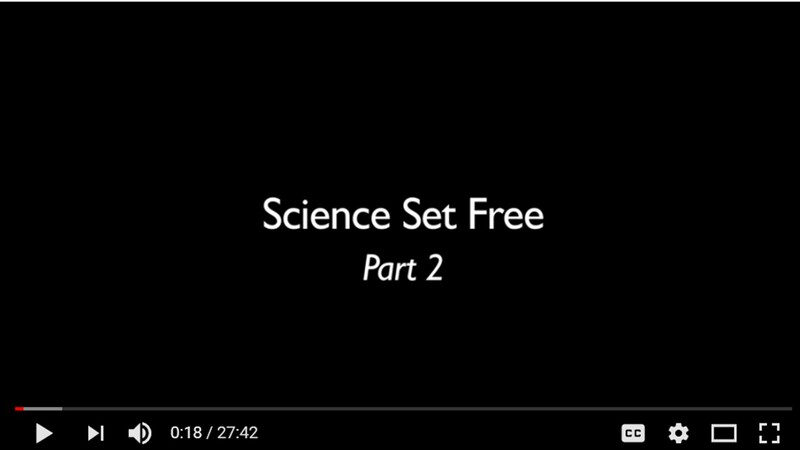 Sheldrake, R. “Science Set Free” (Part 1). Electric Universe 2013 Conference: The Tippng Point. Albuquerque, NM, January 3-6. 8. Sheldrake, R. “Science Set Free” (Part 2). Electric Universe 2013 Conference: The Tippng Point. Albuquerque, NM, January 3-6. Have you ever wondered what really divides the chiropractic profession? For decades the story was that it was the straights vs. the mixers. The straights adhered to the adjustment of the vertebral subluxation only and the mixers added other modalities to chiropractic. The wars between these two factions marked a unique epic in 20th century American history as a conflict between several worldviews. That story evolved and split over the years. For a time it revolved around educational standards and scope of practice issues. Eventually this schism grew into a spectrum between therapeutic vs. non-therapeutic approaches. Across the middle of the spectrum is where most chiropractors practice. And yet, as I have pointed out in other blog posts,[4, 5] the split really comes down to perspectives. There are many ways to discuss this fact such as orienting frameworks, levels of complexity of thinking, values, morals, the list goes on. For this month’s post, I want to emphasize the importance of distinguishing between the inside and the outside perspectives, especially in relation to the organism. I view this as the heart of the conflicting perspectives within the profession and also a place of common-ground. By acknowledging the inside and outside views of “it,” or the objective observation of the organism, Wilber incorporates the latest insights of neurophysiology and anatomy, as well as systems theory and the new biology. For example, anatomy and physiology are the outside view of the body. These can be measured through visual observation and various tests. The inside view of the organism looks to homeostasis, dynamic equilibrium, autopoiesis, and of course, innate intelligence as it relates directly to these processes of life. The processes may be measured in terms of how well the body expresses its organization and how well it adapts. There is a long history of this line of thinking in chiropractic. B.J. Palmer originally wrote about how health comes from above downward and from inside outward as the essence of the philosophy of chiropractic. At the heart of this approach is an emphasis on the body’s ability to self-heal and self-organize. This view of the body is shared by most chiropractors. B.J. contrasted this to the outside inward and below upward approach characteristic of Western medicine. Relying on this view includes an emphasis on materialist and mechanistic paradigms. By acknowledging the importance of inside and outside views of biology, we can more consciously bridge the divides within the profession by embracing a more holistic framework. This is easy because we already share such a framework. The outside view is simple enough. It relates to any focus on the structures of the organism; brain, spine, muscles, signs and symptoms, pathological processes, and even vertebral subluxation as a clinical and definable entity. The inside view includes the body’s natural ability to self-organize, self-heal, effectively adapt, and create its own parts. Traditional philosophy of chiropractic refers to this as innate intelligence. Chiropractic is based not only on an outside view of the body but also on an inside view. This insider view is one defining characteristic of the profession. It sets chiropractic apart from other paradigms of health care. We should always remember however, in order for chiropractic to rightly be defined as its own paradigm, it must have a defining set of practices, not just its own unique viewpoint. One argument in the profession suggests that the defining praxis is the chiropractic adjustment of the vertebral subluxation. [14, 15] To me, this makes the most sense as it is congruent with the characteristic insider view of the body and consistent with the most common practice of chiropractic, the adjustment. What if we could all agree that the two most defining characteristics of the chiropractic profession were the two most common aspects to chiropractic worldwide; the insider view of biology and the chiropractic adjustment? Of course state laws and educational standards will often include more than just the adjustment in terms of scope of practice. Chiropractors love to include other professions within their daily practices from nutrition to acupuncture to physical therapy. But the key to unity is to find where we have common ground. The insider view is the best place to start. 1. Painter, F. Is “Expanded Practice” our Pandora’s Box? September, 13, 2011. 2. Edwards, J. Drugs and Chiropractic: Exposing the red herring and the Trojan horse. Dynamic Chiropractic, 2011. 29(20). 3. Kent, C. The profession formerly known as chiropractic. Dynamic Chiropractic, 2011. 29(10). 4. Senzon, S. Chiropractic Honesty, in Chiropraction. August 27, 2012. 5. Senzon, S. Chiropractic Evolution, in Chiropraction. June 21, 2012. 6. Maturana, H. and F. Varela. Autopoiesis and cognition: The realization of the living. 1980, Dordrecth: D. Reidel Pub. CO.
7. Piaget, J. Biology and knowledge: an essay on the relations between organic regulations and cognitive processes. 1971, Chicago: University of Chicago Press. 8. Thompson, E. Mind in Life: Biology, Phenomenology, and the Sciences of Mind. 2007: Harvard University Press. 9. Wilber, K. The ways we are in this together: Intersubjectivity and interobjectivity. Ken Wilber Online, 2003. 10. Senzon, S. Constructing a philosophy of chiropractic: Integral Map. Online Continuing Education. 2011-present. 11. Senzon, S. Constructing a philosophy of chiropractic I: an Integral map of the territory. J Chiropr Human, 2010. 17(17): p. 6-21. 12. Palmer, B. The known man or an explanation of the “phenomenon of life”; Volume 19. 1936: Davenport, IA: Palmer College. 13. Edwards, J. Primary Care: Be careful what you wish for. Dynamic Chiropractic, 2012. 30(8). 14. Rutherford, L. The role of chiropractic. 1989, Eugene, OR: Health Education Pub. Corp.
15. Gelardi, T. The science of identifying professions as applied to chiropractic. J Chiropr Hum, 1996: p. 11-17. I wrote a little book a few years ago called, The Secret History of Chiropractic. The intent of the book was to bring forth some of chiropractic’s historical facts from an Integral perspective. The story created a context for a categorized collection of some of D.D. Palmer’s most philosophical and spiritual quotes. Much of the history was unknown to the majority of chiropractors I have spoken to. Hence, I used the term “secret” in the title. Some in the profession were well versed in the history. In fact, one of the more famous chiropractic historians criticized my use of the word “secret,” mostly because he and his colleagues were aware of the stories. And yet, as we continue to research and also peel away the veil of bias from our historical writings, we find new gems even today. Instead of criticizing bad history or pointing out misleading facts, I would like to use this month’s blog post to share a few delightful gems and some really good historical accounting. In the last three months, I have had the great honor to lecture on the history of the philosophy of chiropractic in California, Virginia, Mexico City, and South Carolina. In my preparation for these talks, I have encountered many new insights and facts (secrets if you will). I am excited to share these with the profession. The first gems come from my research into the life of Shegataro Morikubo (1871-1933). He was of noble Japanese birth. His father was a governor of a prefecture and his brother served in Parliament. Morikubo came to the United States in 1889 from Japan. While in the states, he converted to Christianity from Buddhism, engaged in graduate studies in philosophy, earned his chiropractic degree in 1906 at PSC, got married, had a child, and eventually settled in Minneapolis, where he practiced, offered summer night classes in his seemingly brief “Academy of Chiropractic,” and eventually formed the Yamato Corporation. I have not been able to uncover much else about his life. I have found several of his writings from before he became a chiropractor. Most of his non-chiropractic writings are on Japanese culture and politics. [3-5] The articles are fascinating especially because it shows us how erudite and educated Morikubo was. Shegataro Morikubo played an important role in the development of the philosophy of chiropractic because he helped to shape the landmark defense in the Wisconsin vs. Morikubo trial of 1907. After reading three of Morikubo’s articles on the philosophy of chiropractic, as well as his writings about the trial, I am more convinced than ever that he played a significant role in the shaping of the defense and the philosophy. I have posted two of his articles below. [7, 8] I will post more in the coming months as I develop an article on Morikubo. Another gem or series of gems I stumbled upon include three articles by the late Bud Crowder (1920-2002), graduate of PSC class of 1947. [9-11] Crowder taught and inspired generations of chiropractic students and interns. These articles were written in 1986 and 1987, a time in chiropractic’s history similar to today in many ways. It is my hope that Crowder’s words will inspire a new generation to go forth and serve humanity through the gift of chiropractic. Finally, I am very happy to share the Chiropractic Parallax series by the chiropractic historian Merwyn Zarbuck (1931-2009), graduate of PSC class of 1951. Zarbuck practiced for 50 years. I received permission to post this very important series on D.D. Palmer and his students. [12-17] (This series is an excellent example of the kind of secrets I mean. Unless you were a member of the Illinois Prairie State Chiropractors Association in the 1980s, you probably have never heard of Chiropractic Parallax!) I know you will enjoy these articles as I have. As more secrets from chiropractic’s past get revealed, we can move forward without bias and embrace the amazing history that is chiropractic’s story. 1. Senzon, S. The secret history of chiropractic: D.D. Palmer’s spiritual writings. 2005. Asheville, NC: Self published. 2. Senzon, S. Concerning Mr. Gibbons’ review of The Secret History of Chiropractic. Chiropractic History, 2007. 27(1): p. 5-6. 3. Morikubo, S. Yamato-Damashu. St. Paul Globe, 1904. July 4. 4. Morikubo, S. Sailing of the Atlantic Fleet: Dr. Shegetaro Morikubo gives Tribune his ideas. LaCrosse Tribune, 1907. December 21. 5. Morikubo, S. Who are the Japanese: Not cousins to the Chinese. St. Paul Globe, 1904. September 4. 6. Senzon, S. Chiropractic Revisions, in Chiropraction. 2012. 7. Morikubo, S. Chiropractic. LaCross Leader, 1907. 8. Morikubo, S. Chiropractic Philosophy. The Chiropractor, 1915. 11(5): p. 13-17. 9. Crowder, E. Stand for Something. Straight from Sherman, 1986. Fall: p. 7,12. 10. Crowder, E. Where is Chiropractic Headed? Straight from Sherman, 1987. Spring: p. 9,12. 11. Crowder, E. Accommodating Without Compromise. Straight from Sherman, 1987. Summer: p. 6,13. 12. Zarbuck, M. Chiropractic Parallax: Part 1. Illinois Prairie State Chiropractors Association Journal of Chiropractic, 1988. January. 13. Zarbuck, M. Chiropractic Parallax: Part 2. Illinois Prairie State Chiropractors Association Journal of Chiropractic, 1988. 14. Zarbuck, M. Chiropractic Parallax: Part 3. Illinois Prairie State Chiropractors Association Journal of Chiropractic, 1988. July. 15. Zarbuck, M. Chiropractic Parallax: Part 4. Illinois Prairie State Chiropractors Association Journal of Chiropractic, 1988. October. 16. Zarbuck, M. Chiropractic Parallax: Part 5. Illinois Prairie State Chiropractors Association Journal of Chiropractic, 1989. January. 17. Zarbuck, M. Chiropractic Parallax: Part 6. Illinois Prairie State Chiropractors Association Journal of Chiropractic, 1989. October. *Crowder articles are republished with permission from Sherman College of Chiropractic. **Merwyn Zarbuck (1931-2009) was one of the great chiropractic historians. Zarbuck graduated from Palmer School of Chiropractic in 1951. He practiced chiropractic for 50 years in Urbana, Illinois. Below are a selection of his writings as well as one of his classic historical finds. Merwyn Zarbuck’s Chiropractic Parallax series are reproduced with permission from his family. Zarbuck, M. A profession for ‘Bohemian Chiropractic’: Oakley Smith and the Evolution of Naprapathy. It has been 99 years since D.D. Palmer’s death. We are still establishing his legacy in the face of decades of lies, half-truths, and outright distortions. Revising the historical record is a painstaking and vital role for the professional literature. This is especially true when new facts shed light on “spurious claims” accepted as fact. For example, there is an important line of historical scholarship that discredits D.D. Palmer’s role in establishing chiropractic’s philosophy. And, this reasoning has been distorted to the point of dismissing philosophy and subluxation altogether. I would like to help set the record straight. It is time to revise our history and give D.D. Palmer and his son B.J. Palmer their proper accolades. The landmark Morikubo case of 1907 established chiropractic as a separate and distinct profession, with its’ own philosophy, science, and art. Lerner reasoned Tom Morris’ legal defense relied on the textbook Modernized Chiropractic, written by three of D.D. Palmer’s students, Langworthy, Oakley Smith, and Minora Paxson. The book does introduce important concepts such as subluxation, IVF encroachment, and the dynamic thrust. It does NOT discuss philosophy in any detail. The main problem is that Lerner offers NO PROOF for his assertion that the defense relied on the text. I have addressed this specific issue before but I have never so plainly written that Lerner’s account is without any merit (as far as I can tell). In the original report, Lerner, who was paid by a NY group of chiropractors to research the early history (in order to get chiropractic legislation passed in NY), displays a strong bias against BJ Palmer. Also, he claims that certain philosophical concepts such as an unseen power in the brain come from Langworthy. They don’t. D.D. Palmer had been studying such ideas for decades. Lerner did not have access to the books that D.D. was studying as they were not available for researchers in the 1950s. Another problem stemming from Lerner’s portrayal of events has led to the argument that the philosophy of chiropractic was merely a legal ploy. There is no doubt that philosophy after the Morikubo trial was very important to ensuring chiropractic was separate and distinct. However, that is only one small portion of the forces that shaped the ongoing development of the philosophy of chiropractic and the chiropractic paradigm. Any accounts that make the legal issue the sole reason for chiropractic’s philosophy are not being honest or are just ignorant. Neither Rehm nor Lerner had the information that was to be published in the last few years; information that makes it clear – the philosophical geniuses behind the defense were B.J. Palmer, Shegato Morikubo, and Tom Morris. Not Solon Langworthy. Lerner and Rehm were unaware of the systematic and planned operation that lasted at least six months and probably longer to prepare for the trial (not the two-week rush to pull the case together that Rehm alleges). In 2005, a landmark paper by Troyanovich and Keating explored the case against Johnson and Whipple, two chiropractors in LaCrosse, Wisconsin, the year before Morikubo was tried there. The chiropractors lost and they even had D.D. Palmer as an expert witness! This article makes a compelling case that Morikubo and B.J. forced the legal issue and sent Morikubo to open up shop in the SAME building as the osteopath that brought charges against Whipple, the year before! Morikubo played an important role in the history of the philosophy of chiropractic. He was not only taught by B.J., but also by D.D. Palmer before the founder left Davenport in 1906. Morikubo lectured on philosophy at the college when B.J. was traveling. Additionally, Morikubo held a correspondence degree in osteopathy and a Ph.D. in philosophy. He was raised in a Buddhist monastery in Japan. And, he was due to return to Japan the year after he graduated. He had nothing to lose by going to Wisconsin to be arrested for the chiropractic cause. I wonder why Lerner didn’t mention the quotes by Morikubo and Linniker? (I will post those quotes in a special gallery on the site in the near future.) In fact, Lerner quotes The Chiropractor from December 1907. Morikubo’s article denouncing the Langworthy claim was in the November 1907 issue! Perhaps Lerner missed it? Doubtful. Is it too late to restore D.D. Palmer’s rightful place as progenitor not only of the chiropractic adjustment but its unique philosophy and science as well? Is it too late to grant B.J. Palmer and Shegatora Morikubo their rightful status as well? I know, some of you may still be wondering, why this is so important. After all, we all know today that D.D. was the founder and that his textbook established the foundation of the philosophy, but that hasn’t always been the case. In fact, when D.D.’s 1910 book was published it was bought up by his competitors and few people read it. It wasn’t until 1950s that the original edition had been reprinted. The seeds are deep! And more importantly, this line of historical reasoning started by Lerner is currently being used not only to discredit the Palmers but philosophy in chiropractic itself. This spurious approach to the philosophy and history has led to the current trends that throw all foundations to the wind and embrace the backwards notions that drugs and surgery will somehow fit within the philosophy of chiropractic. The future of the profession hinges on an accurate and honest portrayal of our history and a visionary, dynamic, and evolving approach to our philosophy. 1. Lerner, C. The Lerner report. 1952, Davenport, IA: Palmer College Archives. 4. Paxson, M., O. Smith, and S. Langworthy, A textbook of modernized chiropractic. 1906, Cedar Rapids (IA): American School of Chiropractic. 5. Senzon, S. The secret history of chiropractic. 2006, Asheville, NC: Self Published. 7. Keating, J., A brief history of the chiropractic profession, in In Principles and practice of chiropractic, S. Haldeman, Editor 2005, McGraw Hill Companies, Inc.: New York. 8. Keating, J., B.J. of Davenport: The early years of chiropractic, Davenport, Iowa: Association for the History of Chiropractic. 9. Folk, H., Vertbral vitalism: American metaphysics and the birth of chiropractic, 2006, Indiana University. 10. Moore, S., Chiropractic in America: The history of a medical alternative1993: Johns Hopkins University Press. 11. Wardwell, W., Chiropractic: History and evolution of a new profession1992, St. Louis(MO): Mosby. 12. Donahue, J., Metaphysics, rationality and science. J Manipulative Phys Ther, 1994. 17(1): p. 54-55. 13. Leach, R., The Chiropractic Theories: A Textbook of Scientific Research: 4th ed2004, Philadelphia (PA): Lippincott. 14. Haldeman, S., Principles and Practice of Chiropractic2004, New York: McGraw-Hill. 15. Senzon, S., Chiropractic games & distortions of truth, in Chiropraction. 2012. 16. Senzon, S., Chiropractic Honesty, in Chiropraction, August 27, 2012. 17. Simpson, J., The five eras of chiropractic & the future of chiropractic as seen through the eyes of a participant observer. Chiropractic & Manual Therapies, 2011. 20(1). 18. Senzon, S., Chiropractic and energy medicine: A shared history. J Chiropr Humanit, 2008. 15: p. 27-54. 19. Senzon, S., Constructing a philosophy of chiropractic: When worldviews evolve and postmodern core. J Chiropr Humanit, 2011. 20. Donahue, J. The man, the book, the lessons: The Chiropractor’s Adjustor, 1910. Chiropractic History, 1990. 10(2):p.35-42. *I should note that some of Lerner’s other observations are intriguing and merit further research. **In a contentious article by Simpson, he cites the Peters and Chance article but stays with the dogma that Morris used the text. This is part of his argument to make the case that subluxation should be banned. I was recently made aware of a blog post written by Stephen Perle, a well-known voice in the chiropractic profession and a professor at a chiropractic college. Interestingly, the subtitle of Perle’s blog is, “A forum for intellectual honesty.” In my view, intellectual honesty requires that we include as many perspectives as possible, not only one, because it is bound to be limited, narrow in focus, and prone to errors. It is obvious that Dr. Perle thinks his approach is historically accurate. Unfortunately, such assumptions are at the core of chiropractic’s internal conflicts. When we don’t consider our own perspectives and how they shade our point of view, we are prone to think that we must be correct. Add to that a hand full of references that come from the same perspective and a self-perpetuating false authority gets established. In my first blog post I compared this to the telephone game. More than anything, I seek to build bridges in the chiropractic profession. Doing so makes it vitally important to point out faulty arguments and bad scholarship so that we may all move forward together. There is hardly anything more important in a profession than good scientific research, accurate historical accounting, and solid philosophical reasoning. When these three methodological approaches are utilized from the widest possible perspectives, we are likely to find large areas of agreement. Perle begins the article by pointing out the important research of the late Joe Keating. One of Keating’s main contributions to the history and philosophy of chiropractic was establishing how D.D. Palmer’s ideas evolved during his final decade of life. Palmer’s use of the term vertebral subluxation was only written down after the 1907 Morikubo trial, and after it was widely used in Smith, Langworthy, and Paxson’s textbook. There is no written evidence of Palmer’s use of the term subluxation before. The term is generally attributed to Langworthy and made important to the profession based on the Morikubo case. So, I don’t really take issue with the fact, that Perle would equate all of D.D.’s previous theories with his final theory. That is common pluralistic thinking in academia. But to suggest that D.D.’s final writings on chiropractic DID NOT set the tone for decades of the profession’s core focus on vertebral subluxation is bizarre. In fact, Perle goes so far as to suggest that embracing the vertebral subluxation as chiropractic’s core identity is an “attempt to revise the history of chiropractic.” Does this seem Orwellian to you? Just look at the facts. The vertebral subluxation as a clinical entity is considered by several researchers and scholars in the profession as its reason for being. [5-7] Furthermore, our understanding of the biological mechanisms of vertebral subluxation is constantly evolving, and not rooted in one model. Historically, it wasn’t just B.J. Palmer and his school that took up the mantle of vertebral subluxation although the Palmer School certainly carried the torch. Many schools and associations have focused on vertebral subluxation going all the way back to the earliest days. Even the leaders of National College of Chiropractic embraced the scientific research of vertebral subluxation since its earliest days; Howard incorporated it into his encyclopedic system, Forster wrote about it extensively, and Janse developed his own theories about vertebral subluxation. [8-12] Not to mention the fact that vertebral subluxation terminology is codified in state law, federal law, Medicare, as well as chiropractic’s main trade organizations. And, 88% of chiropractors want to retain the term. I will be the first to agree that the traditional use of the term was embedded in other philosophical concepts that made it difficult to consider it solely in terms of objective physiology, but that is another discussion. The historical and scientific veracity of vertebral subluxation is hardly the main issue at hand. The issue is really philosophical honesty while understanding the importance of perspectives. I will discuss this issue based on three other historical inaccuracies and omissions from the Perle blog post. All three can be viewed in terms of the philosophical perspectives that the Palmer’s attempted to imbue into the profession and a lack of understanding of the role perspectives play in human thinking. The next problem comes from Perle’s referencing of Gaucher-Peslherbe’s research. [14, 15] He points out the important fact that D.D. Palmer was indeed better read in anatomy, physiology, and surgery than most medical doctors of his day (Perle doesn’t go that far, but Gaucher-Peslherbe does). Perle then uses this fact along with D.D.’s revisions of his ideas to suggest that chiropractors today should be able to rethink chiropractic. If that were it, I would say, sure whatever, that seems to be what has been happening anyway if you read the literature on vertebral subluxation research, and keep up with technique development in the profession. The problem is that Perle completely omits Gaucher’s main conclusions about D.D. Palmer’s theories and the important role they played in the history of physiology. He even went so far as to compare Palmer’s wider philosophical approach in terms of subluxation and “what causes disharmony in man,” to philosophers from the last century such as Bergson, Freud, Merleau Ponty, and Heidegger. The intent of the Rehab Lab was congruent with Palmer’s Innate philosophy. The premise of the lab was that the internal self-organizing functions of the organism should be allowed to assimilate the energetic changes set in motion by the adjustment through self-guided movements. Thus the whole concept of rehabilitation was turned on its head. I would add, this was because it originated from a perspective that focused on the inherent autopoietic aspects of the organism. It was an inside-out approach to assist the organism to more fully integrate and express the innate intelligence. Yet another mistake in the blog post is the erroneous claim that the term “innate intelligence” was coined in the book Modernized Chiropractic and used by Palmer after the Morikubo case like subluxation. Not true. Palmer’s first documented use of Innate comes from an article in 1906. [16, 17] In addition, Modernized Chiropractic does not even mention Innate Intelligence! As I see it, the core issue (besides mistakes) is a misunderstanding of the role of perspectives in chiropractic. This is a common problem in chiropractic and in most professions. As adults develop, the research shows that they can increase in the complexity of their thinking and be able to take on more and more perspectives. The level of thinking that most adults are assured to reach is the objective, rational, third-person point of view. Research shows, somewhere around 40% of our culture are at this level. [19, 20] It used to be thought that this was the height of human development, the rational scientific thinker. This is the person who can comfortably deal in 3rd person perspectives. That is, he or she can take the role of another and even view themselves as an “it” or an “object.” Children have not developed this ability yet, and teens are new to this perspective. Here is the problem, not only may people develop to even more complex ways of viewing the world, such as 4th person perspectives, 5th person perspectives, etc…, but those of us who spend our days relying on 3rd person perspectives might miss that! We don’t even know those other perspectives exist. And, we may generally confuse all other perspectives as less objective than ours, because anything that is not 3rd person perspective tends to look the same to us; probably 2nd person, or at least dogmatic or fundamentalist. This becomes a real problem in a profession like chiropractic because evidence shows that D.D. Palmer was one of the first post-conventional thinkers of our era and may have attempted to establish the first 4th person perspectival profession. And get this, his son may have even developed to 5th person perspectives or higher in his later years. Let’s just all take a step back and acknowledge that we might not have the entire truth even though it sure feels like we do. In fact, we might each have partial truths that could in some way blend together and make for a much stronger profession. Instead of dismissing “everyone” you disagree with as dogmatists, which has become a very tired and philosophically shallow approach in the profession,[23, 24] let’s see if we can determine what else might be going on that other scientific researchers, perhaps in the social sciences, might shed light upon that we are just missing. Honesty comes from facing things you did not even know were there and accepting them. 1. Perle, S. 2009. Foundation for Anachronistic Chiropractic Pseudo-Religion, in Perles of Wisdom: A forum for intellectual honesty. 2. Senzon, S. 2012. Chiropractic games & distortions of truth, in Chiropraction. 3. Keating, J. 1992. The evolution of Palmer’s metaphors and hypotheses. Philosophical Constructs for the Chiropractic Profession, 2(1): p. 9-19. 4. Smith, Oakley G., Solon. M. Langworthy, and Minora C. Paxson. 1906. Modernized chiropractic. Cedar Rapids, Iowa: S.M. Langworthy. 5. Haavik-Taylor, H., K. Holt, and B. Murphy. 2010. Exploring the Neuromodulatory effects of vertebral subluxation. Chiropr J Aust. 40: p. 37-44. 8. Beideman, R. 1996. The role of the encyclopedic Howard System in the professionalization of Chiropractic National College, 1906-1981. Chiropr Hist. 16(2): p. 29-41. 9. Phillips, R. 2006. Joseph Janse: The apostle of chiropractic education. Los Angeles: R. Phillips. 10. Janse, J. 1975. History of the development of chiropractic concepts: Chiropractic terminology, in The research status of spinal manipulative therapy: A workshop held at the National Institutes of Health, February 2-4, 1975. M. Goldstein, Editor. U.S. Department of Health, Education, and Welfare: Bethesda. p. 25-42. 11. Forster, A. The White Mark: An editorial history of chiropractic. 1921. Chicago: National Publishing Association. 12. Forster, A. 1923. Principles and practice of chiropractic. Chicago: The National Publishing Association. 14. Gaucher-Peslherbe, P. G. Wiese, and J. Donahue. 1995. Daniel David Palmer’s Medical Library: The Founder was “Into the Literature.”. Chiropr Hist. 15(2): p. 63-69. 15. Gaucher, P. 1993. Chiropractic: Early concepts in their historical setting. Chicago: National College of Chiropractic. 16. Zarbuck, M. 1988. Innate Intelligence (Part 1). Illinois Prairie State Chiropractors Association Journal of Chiropractic, 1987. 8(4): p. 12-13. 17. Zarbuck, M. 1988. Innate Intelligence (Part 2). Illinois Prairie State Chiropractors Association Journal of Chiropractic, 1988. 9(1): p. 11,16. 18. Senzon, S. 2011. Constructing a philosophy of chiropractic: When worldviews evolve and Premodern roots. J Chiropr Humanit, 18(1);10-23. 19. Cook-Greuter S. 2007. Ego development: Nine levels of increasing embrace. Wayland, MA: Cook-Greuter & Associates. 21. Senzon, S., Constructing a philosophy of chiropractic: When worldviews evolve and postmodern core. J Chiropr Humanit, 18(1);39-63. 22. Senzon, S., B.J. Palmer: An integral biography. Journal of Integral Theory and Practice, 2010. 5(3): p. 118-136. 23. Keating, J., et al. 2005. Subluxation: dogma or science. Chiropractic & Osteopathy, 13(17). 24. Simpson, J. 2011. The five eras of chiropractic & the future of chiropractic as seen through the eyes of a participant observer. Chiropractic & Manual Therapies. 20(1). *Please click here to explore photos and quotes about the BJPCC Rehabilitation Lab. **These themes are explored in greater detail in my online courses. Let’s go back to the Greenbooks from the 1920s and the role they may have played in 20th century biological and systems thinking. I know, I know, you wonder, “Why should we even bother with those old books?” Well, WE SHOULD…and I’ll tell you why. I made a small point in my last blog post about those books and how they represented an early attempt at an integrated curriculum. A curriculum, mind you, that sought to integrate a systems worldview into biology, while also including links between mind, body, and spirit. An approach like that is not even included in “the mainstream” today. The approach in those early days offered a MORE INTEGRATED educational system than the CCE/NBCE dominated curricula of the 21st century! By reconnecting to that philosophical lineage, we may just help chiropractic to continue to be at the edge of biological and philosophical thought. I wonder how many generations of students of chiropractic philosophy, did not buy the book or did not REALIZE it was actually a philosophy text…but that is another story. In fact, I recently acquired what seems to have been Craven’s copy of the 1st edition. Hopefully scholars with some time on their hands can compare and contrast the differences between editions. To accurately understand the early and seminal ideas from the philosophy, we should be able to DISTINGUISH Craven’s ideas from B.J. Palmer’s. Another important influence on the early Greenbooks, was the republication of D.D. Palmer’s two books. B.J. edited and published them in 1921 as a second Volume IV. D.D.’s books were generally not available at that point. We can only surmise that access to this version (edited by B.J.) was an inspiration to many. The other main authors from PSC included, James Leroy Nixon, S.L. Burich, Henry Vedder, Mabel Heath Palmer, James Firth, & Arthur Holmes. There is hardly room in this short post to expand on their writing, which is okay, because I have created some EXCERPTS for your enjoyment on this site (just click on the reference links below). Each excerpt explores how these authors incorporated Innate Intelligence in their writings on topics like pathology, chemistry, physiology, anatomy, and law. IMAGINE if we can revisit this idea and develop NEW core curricula that incorporated the perspective of Innate Intelligence into every course? Even more important in my view, these texts demonstrate how the philosophy of chiropractic was at the leading edge of biological thinking ninety-years ago! Just a glimpse through the applications of systems theory, chaos theory, and complexity theory for medical practices today will demonstrate that fact. The references would take too long. 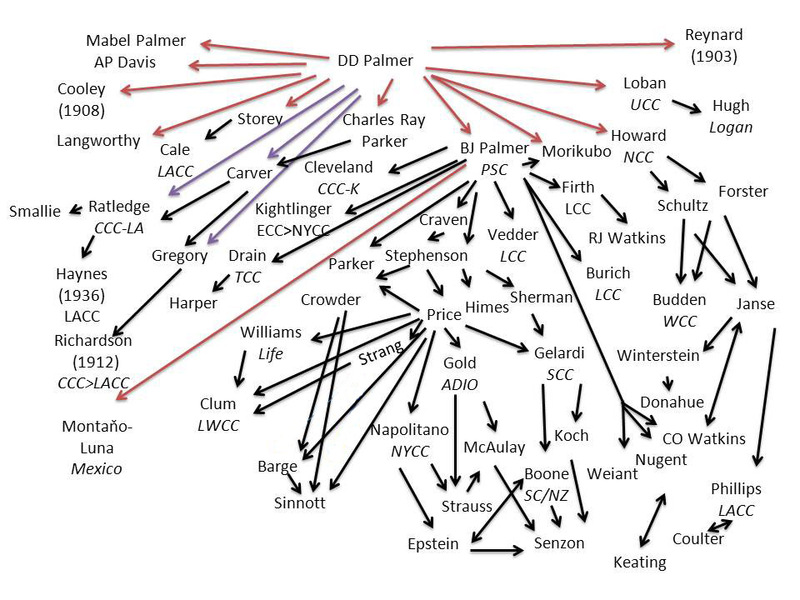 Just go to google scholar and search terms like, “systems theory and medicine,” “chaos theory and heart,” or “complexity theory and illness,” or anything like those terms and you will be inundated with lots of great research. Is it possible that the philosophy of chiropractic had an impact on the current trends in biological thinking? Just think about it, during those years of the 1920s, B.J.’s radio stations were HEARD all the way to Alaska, there were over a hundred schools over the years, thousands of chiropractors, and even more patients. How might this philosophical approach have impacted American thought? Better still, how might the profession today take ownership of its own philosophical approach and use it to further human knowledge and deepen human experience? What if the chiropractic adjustment of the vertebral subluxation could be used as a way to demonstrate the physiological implications of some of the latest approaches in theoretical biology? What if we were able to make the appropriate linkages between the leading theories in neurophysiology and heart-rate variability to the philosophy of chiropractic and bring that into the classroom? Or even the boards? The future is bright if we stay at the leading edge, where chiropractic belongs. 2. Craven, J. Universal Intelligence, in Philosophy of Chiropractic1920, Palmer College of Chiropractic: Davenport. 3. Palmer, B. ed. The Chiropractic Adjuster; A compilation of the writings of D.D. Palmer. Vol. 4. 1921, Palmer School of Chiropractic: Davenport, IA. *Available as pdf from Chiropracticbooks. 4. Stephenson, R. Chiropractic textbook. 1927, Davenport: Palmer School of Chiropractic. 6. Senzon, S. A history of the mental impulse: theoretical construct or scientific reality? Chiropr Hist, 2001. 21(2): p. 63-76. 7. Nixon, J. The spirit of the P.S.C. : A story based on facts gleaned at the chiropractic fountain head. Vol. 14. 1920, Davenport: Palmer School of Chiropractic. 8. Burich, S. Chiropractic Chemistry. Vol. 11. 1920: Palmer School of Chiropractic. 9. Vedder, H. Chiropractic Physiology. Vol. 8. 1922, Davenport: Palmer School of Chiropractic. 10. Heath Palmer, M. Chiropractic Anatomy. Vol 9. 1923, Davenport: Palmer School of Chiropractic. 11. Firth, J. Chiropractic Symptomatology. Vol. 7. 1925, Davenport: Palmer School of Chiropractic. 12. Holmes, A. Malpractice as Applied to Chiropractors. Vol. 17. 1924, Davenport: Palmer School of Chiropractic. 13. Keating, J. Chronology of radiophone station WOC: 1922-1932, N.I.O.C. Research, Editor 2008: Phoenix. In the last century, chiropractic pulled itself up by its bootstraps and BECAME a profession. This unique occurrence had NEVER happened before. An apprentice-style school of healing evolved to become the largest drugless health profession in the world. In the process of this rapid evolution, a culture war of epic proportions was fought. First, there was D.D. Palmer offering an apprenticeship for $500. Several medical doctors, osteopaths, homeopaths, midwives, and patients studied with D.D. in those early years. The training lasted between two to six months. Palmer issued diplomas, which read, “practice and teach.” His students would soon branch off and open schools, publish texts, and compete with Old Dad Chiro for students and dominance. Challenged by legal statutes, his own son, and the competition, D.D. Palmer developed a philosophy along with the art and science. He hoped to SOLIDIFY his LEGACY. One of the facts of life, WELL UNDERSTOOD today, but NOT yet established in 1899 (when the first class graduated under D.D.’s tutelage), is that individuals view the world through PERSPECTIVES. This is important because the culture war at the heart of chiropractic’s professionalization is a reflection of these perspectives clashing in various ways. Before D.D. died of broken dreams, he helped to pioneer NOT ONLY chiropractic, but an ENTIRELY NEW perspective through which to view the world! To be perfectly clear, I am not writing some RAH RAH, bumper-sticker styled pseudo-philosophy post. I am referring SPECIFICALLY to the fact that D.D. Palmer evolved, in his own consciousness, to view the world through 4th person perspectives. This is sometimes referred to as an “early systems-worldview” or a “pluralistic worldview.” It is also an evolution from a 3rd person perspective. The western scientific worldview is based on the 3rd person perspective, which includes the ability to see the world through someone else’s eyes. Objective empirical facts are its main purview. A 4th person perspective goes the next step. It takes a wider stance. From the 3rd person, the individual might include the perspectives of his children and parents. From the 4th however, the person may also include consideration of his children’s future and his parent’s past. This perspective includes context, time, as well as whole systems in a holistic way. Today we take this type of perspective for granted. Since the 1960s, it has become a common worldview (political correctness, civil rights, holistic thinking, etc…). Just a few years ago, research indicated that about 20 million Americans view the world through this perspective. D.D. Palmer was one of the first. He was decades ahead of his time. D.D. Palmer understood the body as one hierarchical system, controlled by the nervous system and DEEPLY INFORMED by an organizing intelligence. The expression of this intelligence through matter defined life. Interference to this expression was tantamount to a cosmic disconnect of the life system, resulting in disorganization and dis-ease on many levels: body, mind, and spirit in society and culture. The medical paradigm has dominated one side of the culture war. The systems and holistic paradigms characterize the other side. Somewhere in between there have always been dogmatic believers on both sides (more fuel for the warfare). On top of that, both sides consider their professional lineage in a direct line to D.D. Palmer, no matter how remote philosophically they may be from his teachings. Chiropractic EVOLVED into a profession but has not yet embodied the perspectives of its founder. In fact, there are still factions in the profession (some of the most powerful ones) seeking to keep chiropractic limited to the medical-rational perspective rather than evolve. Do we go backwards or do we find a way to include as many perspectives as possible and evolve as D.D. did, as the profession did, and as the future of the profession demands. The gift of being a member of a profession is this; the choice is ours.